Pork cutlet with smoked almond crust and exotic banana, tomato and bell pepper salsa! Delicious crispy pork gets married to sweet banana in a spectacular fashion. For me, this is a truly exciting combination! I hope you share that feeling. The idea for this dish came when I read James Briscione’s book The Flavor Matrix. Turns out almond, pork and banana go really well together because they all share the chemical flavor compounds. By coincidence, I featured the delicious combination of pork with banana also in my own book Flavor Math as combo #48, before even reading Briscione’s book. Rich smoky bacon lifts up the intoxicating sweet banana to new culinary heights. This savory & sweet combination just brings out the best of both worlds. Ever thought of making a grilled sandwich with crispy bacon, sliced banana, and peanut butter? Allegedly this sandwich was Elvis Presley’s favorite. Check out my book “Flavor Math” for this and other crazy but absolutely irresistible flavor combinations. It’s available digitally (PDF) now! You are basically making an almond crusted pork schnitzel here. Sounds super complicated and daring but it’s actually super easy. Three plates: egg, flour, ground almonds. Dip-dip-dip-fry-done! The most frustrating thing about schnitzels is when the coating comes off… this is something that can, however, be very easily avoided. Do you know how? By doing nothing! (What a Buddhist approach to cooking…) Don’t be tempted to do anything once your schnitzels are in the pan. Don’t shake the pan, don’t poke around with your spatula, just let your schnitzels be and trust your pan! Turn them only once carefully. That’s all. I use smoked salted almonds for this recipe. My local Turkish butcher always has these in stock. If you can’t find smoked almonds, regular almonds will do as well. Ready for a mouthwatering flavor adventure? Finely dice the bell pepper, slice the spring onions at an angle into fine rings, (if used: finely dice the jalapeno), chop the cilantro, dice the tomato and slice the banana. Place all the cut ingredients in a food processor, add the brown sugar, lime juice, as well as a touch of salt and pepper. Pulse a few times to make the salsa come together. You want a coarse chunky consistency. Rest for up to 1 hour to let the flavors infuse or use straight away. In the fridge, the salsa will hold for 1 day in a sealed container. Place the smoked almonds in a food processor and blend until they resemble coarse flour. Place ground almonds on a deep plate. Whisk the egg and place on a second deep plate. Place flour on a third plate. Put a skillet on medium-high heat, add the oil and let heat up. Pat the pork cutlets dry with kitchen towels, dust with the flour from both sides, drench through the egg and let the excess drip off, then coat with the almond crumbs all over. Slightly press the almond crumbs onto the cutlets to make sure they stick. Place in the hot oil, reduce heat to medium and cook for 4 minutes until golden brown. Flip carefully and cook for 3 minutes on the other side. Place on kitchen towels to catch any excess oil, let rest for 1 minute, then serve immediately. 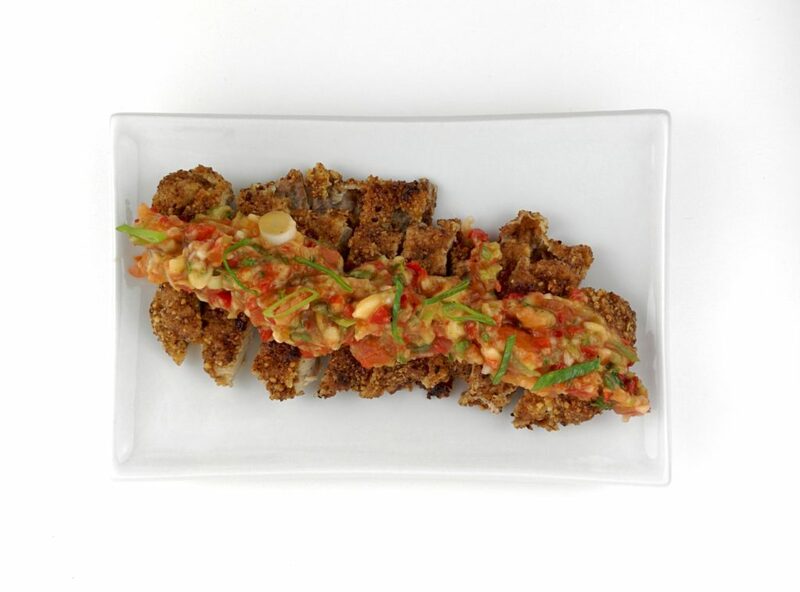 Slather your almond-crusted cutlets with the banana salsa and dig in! Have you ever had pork with banana before? What do you think of the crunchy smoky almond crust? Doesn’t it make this schnitzel just irresistible? Share your thoughts and suggestions with us in the comments below! PS: This recipe is inspired by the idea that pork shares chemical flavor compounds with almonds, tomato, and banana. That’s why they work so well together. Check out James Briscione’s book on food pairing if you are interested in digging deeper into this!